One of the first things I did upon arriving Baguio was getting my bike tuned up. The crash going down from Mayoyao (Banaue) left my bike misaligned in more than a few places. The locals suggested I take it to Go Fast Bike Shop. Fermin, the master mechanic, took tender loving care of it and brought it back to trail worthiness. 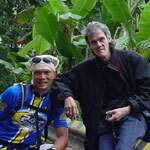 I also met Aris, an avid mountain biker and organizer for the upcoming race. I was lucking out here. What are the odds of me going to Baguio with my mountain bike when a race is actually being held? I was still not 100% with my heavy coughing but that did not keep me from covering the event. I was all smiles. This race would not have happened without the dedication and enthusiasm of racing afficionados Aris Matibag, John Concepcion and Richard Navalta. The course was about 45K of mixed road and dirt-riding going towards Ambuklao. Not surprisingly, the ride is either going up or going down - there's hardly a flat terrain in Baguio. Rider turnout was much more than expected - 117 spanning 3 racing categories: 31 years and above, 30 years and below, and Executive. Registration included lunch, t-shirt and certificate. Prizes consisted of cash and gear. More swag would have been available, but according to Aris, the 2 main sponsors, Power Bar and Sun Cellular, backed out at the last moment, leaving the organizers holding the bag. Race events happen largely because of corporate sponsorhip. Not getting one is bad enough. But for one to say yes and reneg at the last minute (when all the expenses are already in) is like being kicked in the groin. It was only thru the selfless efforts of the mtb community that the race pushed through...kudos to them. As a way of supporting the companies who supported this race, I'm posting their names on this page. You can show your support by patronizing their products or just giving them a smile and a tap on the back. A pleasant surprise happened during the race when a senora came out of her driveway with a big bilao full of bananas for the racers to pick up as they sped along. When thanked, I heard her say,"...muy bien". Allow me to say,"Gracias!" Guess who I spotted watching by a road railing? Rock and Roll's grand icon, Pepe Smith was just sitting there. I was star struck again. I should have continued with the race, but it's unlikely I'd chance on Pepe again like this. I pulled over and engaged him on a tête-a-tête. He has been a Baguio citizen for the last 4 years and goes to Manila only for gigs. June 11 at the World Trade Center is the big date for his reunion with the Juan dela Cruz band. Don't miss it. The racers were well ahead after I left Pepe so I just chilled with the organizers on a junction waiting for the pack until they showed up on the way back. The ever-present Katti shows up inviting me to head the racers off. We did...and got lost. We somehow ended up in the most polluted bowels of La Trinidad and Baguio, inching through city traffic until we reached the finish point. The whole thing was more an exploration to me than it was a race...but it was all good. Mountain bikers (cyclists in general) are somewhat environmental activists. They know more than the average Joe what it's like to have less cars and more bikes on the road - less pollution, less congestion, fitness for everyone and preservation of the environment (less fossil fuel emission). They represent one of the many advocacies from the grassroots level contributing a positive change to a compelling issue very few address. Given the more-than-expected turnout of riders for this event, there is perhaps a swelling tide of sports enthusiasts who underscore the urgency at hand. With tireless efforts and passion of the race organizers, I see the sport (and invariably the cause) heading towards the right direction. (Wed, 8 Jun 2005) magandang araw. ngayon ko lang nabuksan email ko kasi medyo busy. maglalaro kami ng adventure race sa june 10 sa Bangui Ilocos. ang ganda ng pagpapakilala mo sa amin dito sa Baguio lalo na sa grupo. maraming salamat. sa mga sponsors namin, mga kakilala lang namin dito ang nalapitan namin. maraming maraming salamat uli..Naimbag nga aldaw.